Elaine Lucille Schwartzenburg was born on March 8, 1929, in Marksville, Louisiana, to Errol Schwartzenburg, a grocery store owner, and Myrl Dupuy Schwartzenburg. When she was nine years old, she contracted a bacterial bone infection in one leg, underwent several surgeries, and spent five years recuperating.2 She graduated from Marksville High School and, in 1949, she married her childhood sweetheart Edwin W. Edwards, a Marksville, Louisiana, native and a lawyer. They raised four children: Anna, Vicki, Stephen, and David. Edwin Edwards embarked on a long political career in which he served as a Crowley, Louisiana, city councilman and a state senator. In a 1965 special election, Edwards was elected as a Democrat to the first of four U.S. House terms as a Louisiana Representative. Elaine Edwards was active in her husband's political campaigns at the district and state level. She remained at the family home in Crowley while her husband was in the House of Representatives, but she answered phone calls at home on a second line, working with individual constituents to resolve Social Security and veterans' requests and relaying the information to Congressman Edwards's Washington office.3 As her husband's political career developed, Elaine Edwards participated in a variety of civic and philanthropic pursuits ranging from the Special Olympics to a project that raised $1 million for the Crippled Children's Hospital of New Orleans.4 Congressman Edwards left the House in May 1972 to serve as governor of Louisiana, where he remained for a total of four terms. Elaine Edwards was initially reluctant to accept the post, admitting at one point, "I never wanted to be liberated from sewing, cooking, or even gardening." Critics charged that she was merely a "caretaker" or "seat–warmer" who represented the views of the Louisiana governor's mansion in the Senate by consulting Baton Rouge before each vote.7 The New York Times editors described it as a "hollow interim appointment" and also decried the fact that Edwards's "function…will be to represent other women by supinely taking orders—and from men at that." Edwards conceded, "I'm no U.S. Senator" and said she believed she would "get along fine" under the guidance of her state delegation and its dean, Senator Russell Long.8 After a brief meeting with President Richard Nixon in the White House, she took the oath of office on August 7, 1972. Asked if she was likely to vote against her husband's advice, Edwards replied, "I doubt it. "9 She also pledged not to run for the full Senate term. The senatorial role seemed to suit Elaine Edwards. A month into her new job she told the Washington Post: "I like being a Senator very much. I would have liked to have been able to run and keep the seat this fall, had I not been the first lady of Louisiana.…But I am going to stay with Ed and do whatever he's doing. 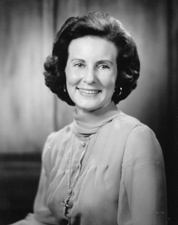 "14 Acceding to her husband's wishes, Edwards resigned her seat on November 13, 1972, in order to provide Louisiana Senator–elect J. Bennett Johnston an edge in seniority by finishing the remainder of Ellender's term. As she prepared to retire, nine colleagues, including Henry "Scoop" Jackson of Washington and Hubert Humphrey of Minnesota, delivered tributes to Edwards on the Senate Floor. "It is unfortunate that Mrs. Edwards will not be in the Senate for a longer period of time," Jackson said. "It is obvious, even during her short tenure, that she has the ability and capacity to become one of the more influential Members of this body. "15 Elaine and Edwin Edwards divorced in 1989 after 40 years of marriage. Elaine Edwards retired to Baton Rouge, where she lived until her death on May 14, 2018. 1Congressional Record, Senate, 92nd Cong., 2nd sess. (17 October 1972): 36738. 2American Mothers Committee, Mothers of Achievement in American History, 1776–1976 (Rutland, VT: C.E. Tuttle & Co, 1976): 233–234. 3Hope Chamberlin, A Minority of Members: Women in the U.S. Congress (New York: Praeger, 1973): 347. 4See, for instance, Mothers of Achievement: 233–234. 5"Lady From Louisiana," 4 August 1972, New York Times: 30; Chamberlin, A Minority of Members: 346. 6Chamberlin, A Minority of Members: 346–347. 7See, for instance, "Seatwarmers," 15 April 1982, Washington Post: A24. 8‘Liberated' quote in Karen Foerstel, Biographical Dictionary of Congressional Women (Westport, CT: Greenwood Press, 1999): 79; "Lady From Louisiana," 4 August 1972, New York Times: 30. 9"New Senator Sworn," 8 August 1972, New York Times: 39. 10Chamberlin, A Minority of Members: 348. 11Congressional Record, Senate, 92nd Cong., 2nd sess. (12 October 1972): 35329. 12Spencer Rich, "Senate Kills Viet Fund Cutoff," 27 September 1972, Washington Post: A1. 13"Angry Scene on the Senate Floor," 4 October 1972, New York Times: 94. 14Jeannette Smyth, "Louisiana Get–Together," 15 September 1972, Washington Post: B3. 15Congressional Record, Senate, 92nd Cong., 2nd sess. (18 October 1972): 37713–37714. "Elaine S. Edwards," in Women in Congress, 1917-2006. Prepared under the direction of the Committee on House Administration by the Office of History & Preservation, U.S. House of Representatives. Washington, D.C.: Government Printing Office, 2006.